This window displays the Wizard templates available for creating profiles and allows a Wizard for profile creation. MX 5.1/MX5.2 - Select this for Zebra Lollipop devices, which include the StageNow Client. MX 5.0 - Select this for Zebra KitKat devices, which include the StageNow Client. MX 4.4 - Select this for Zebra KitKat devices, which include the StageNow Client. 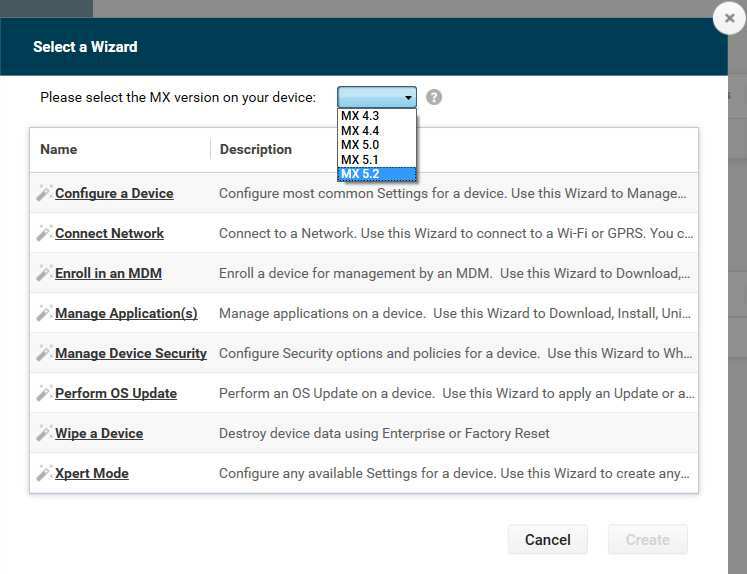 MX 4.3 - Select this for Zebra Jelly Bean and older TC70 Kit Kat devices that ship with the Rapid Deployment Client. Once you select the MX version, the selection is saved for subsequent profile creation.